Yap Eng Chiam (photo right) continue his excellent form to maintain his lead after day 4 of the 5th Singapore Challengers International Open Chess Tournament. 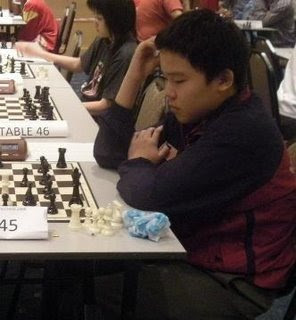 Yap Eng Chiam who remain unbeaten , score 1.5 points from today rounds ( Round 7 and 8). In round 7, he settle with a draw against Singaporean CM Jarred Neubronner (FIDE 2170) before beating Indonesian FM - Rian Kapriaga (FIDE 2054) in round 8 . He now lead the tourney with 7 points . He is follow closely by three Singaporean - CM Jarred Neubrroner ( FIDE 2170) , Jerome Eng Andre (FIDE 2049) and Tan Weiliang (FIDE 2040) with 6.5 points each. In the final round ( round 9) tommorow, he will be paired against Singaporean Jerome End Andre (FIDE 2049). Lets pray that Eng Chiam will win that game and retain the title in Malaysia for two consecutive years after Justin Ong last year victory ! Below are Malaysian players overall standings and points.